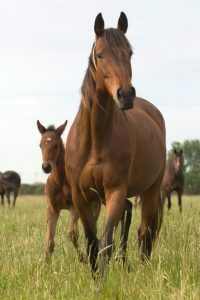 This year has seen FFS or fragile foal syndrome get a lot of attention in the Warmblood community around the world. However as we learn more about this disorder it’s become clear that FFS is not just in Warmbloods. There are many Australian breeds that are likely to carry this gene. Later this week we will be moving FFS testing from the ‘Warmblood’ category to the ‘Multiple breeds’ category on our website and updating the disorder description to make it clear that it is relevant to many breeds. So why haven’t we seen reports of Thoroughbred foals or other foals being born with extremely fragile skin? It seems likely that the almost all foals affected by FFS are aborted, though at what point in their gestation we don’t know yet. This brings me to my final point – we would now characterise FFS testing primarily as a fertility tool, similar to GBED testing. GBED is part of the QH 5-panel. Both appear to cause foetal losses, and there is no treatment available for the foal the rare instances where it survives until birth. We will provide further updates as more information becomes available. For those wanting more information on FFS we put together a summary in May this year that is available here.